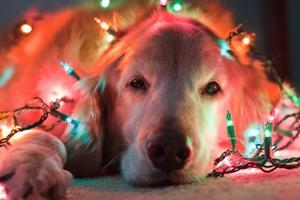 12 Covered Cords: Cords used for holiday lights can be tempting to chew for many pets. Take time while decorating to tape down or cover cords to help prevent shocks, burns or other serious injuries. 11 Tempting Table Scraps: Rich scraps such as drippings, gravy and poultry skin can cause pets to suffer from upset stomach, diarrhea and even pancreatitis, which are not only terribly painful but can be fatal. Giving your dog poultry bones is also a bad idea as they can splinter and get stuck in your dog’s gastrointestinal tract. 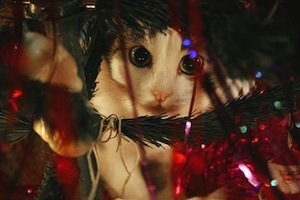 10 Radiant Ribbons: Cats may be interested in playing with or eating tinsel and ribbons hanging from trees. These decorations should be placed high on the tree or not used at all because they can potentially cause serious intestinal damage if swallowed. 9 Dinging Doorbells: Consider putting your dog on a leash before people start arriving. Not only will you be able to control him if he begins to jump, you’ll also avoid him running out the door. 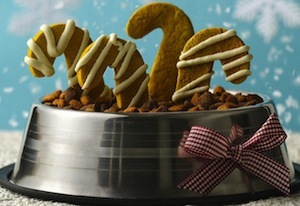 8 Tasty Treats: Keep human party snacks out of reach from animals and offer pet-friendly options instead, such as BLUE Santa Stew Holiday Feast and Santa Paws Snacks. 7 Quiet Corners: Provide pets with a quiet place to retreat so they can choose whether to come out and visit or keep to themselves when company arrives. 6 Patient Puppies: Tell your guests that your puppy is in training, and he needs to be polite before they say “hello” to him. 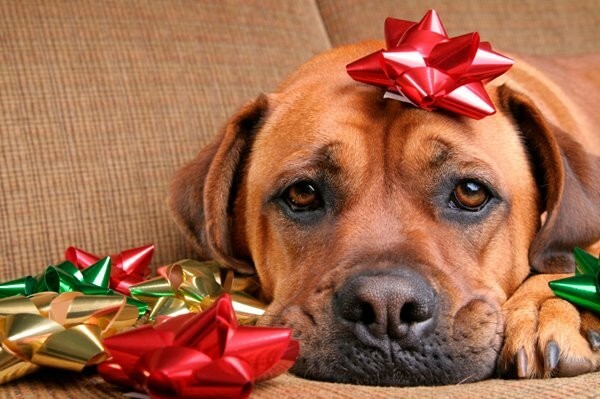 Have your dog sit, using a treat if necessary, and once he’s sitting and calm let your guests pet him. 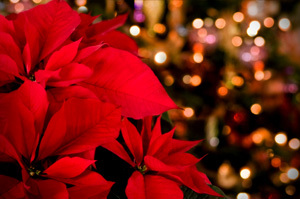 5 Perilous Plants: Mistletoe, holly berries and poinsettia plants are all poisonous for dogs, so skip them as decorations or make sure they are out of reach. 4 Guarded Glasses: Alcohol and pets do not mix. Place alcoholic drinks safely out of reach and patrol the party to be sure your guests do the same. Alcohol poisoning can be fatal. 3 Calming Coats: Using a ThunderShirt can calm a nervous dog by applying gentle pressure to the body. In addition to the traditional coat, there are now cold weather ThunderSweater and ThunderCoat options. 2 Nearby Numbers: Keep contact information for your veterinarian and the nearest emergency veterinary clinic readily available in case of a holiday mishap. 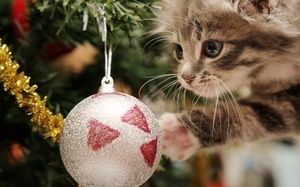 1 Towering Tree: Seasonal trees are sure to attract a pet’s attention and should be secured to keep from toppling over if a pet should try to climb them, use as a scratching post or simply bump into them. 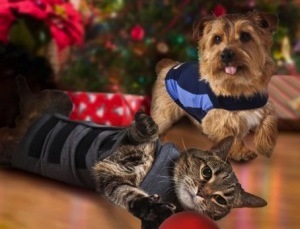 For more information on how to keep pets safe during the holiday season, visit www.petsmart.com.